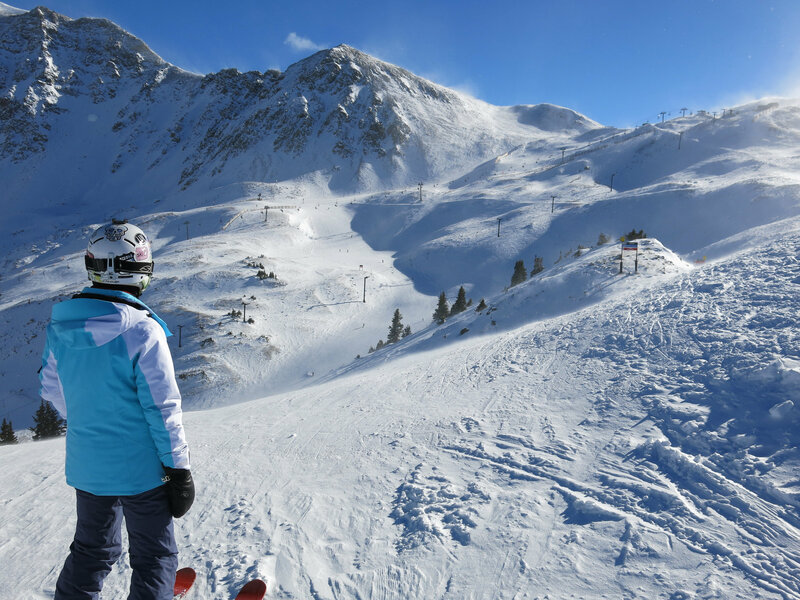 Arapahoe Basin is one of the classic “must ski” destinations that brings back a sense of ski history. These days it is mostly known for having a great party culture in the spring and staying open usually into June, as well as being the first resort to open in North America most years. 2016 was the 70th ski season at A-basin. We skied A-Basin after having another mediocre day at nearby Keystone, which on paper is a much better resort with more of everything. However, we had much more fun at A-Basin and when we think back on that trip, it’s that day we remember most. Starting the day, the parking situation is great with a large parking lot right next to the lifts. No long walks through a real-estate development required. Most people will start the day on the Black Mountain Express chair, which is the only high-speed lift at the resort. We just used that one for access to the Lenawee Mountain triple chair because we were expecting some increasing winds and possible snow showers in the afternoon. We wanted to get as much of the upper mountain done as possible while we could. The wind was very strong at the top, but the way that chair is situated it is remarkably tolerant of wind so it never closed. The snow was thin being early-season but it was dry with some great wind-deposited pockets and excellent grooming. It’s interesting to me how they use snow fences and grooming to farm the snow and get it to stick to the mostly treeless upper mountain. The Lenawee chair has some great steep blues and some moderate black runs on the lower part, and we ended up skiing every run on that chair before we moved on. The views from the top are spectacular in every direction. It’s a good time to mention that the trail ratings at A-Basin seem a little aggressive with some of the runs rated as blues that would usually be rated black at most resorts. The other chair on this part of the mountain is the Norway double and it wasn’t open. I’m not sure if it ever opens except when it’s crowded because I can’t really see a need for it since it serves the same terrain as Lenawee. All of the terrain under that lift was bare rock due to the winds that scour that area. Maybe later in the season it fills in, but at least the year I skied there in May it was similar as I recall. We had lunch at the base area Legends Cafe where they make some good fish tacos. we would rate the food above average for a small resort cafeteria. After lunch we tried to fill in as much of the rest of the resort as we could. We skied just about every run on the Black Mountain express where they have some easier blues that are nicely groomed. We also skied the Pallavicini double chair which is a very steep chair that climbs straight up the steepest part of the resort on the west side. 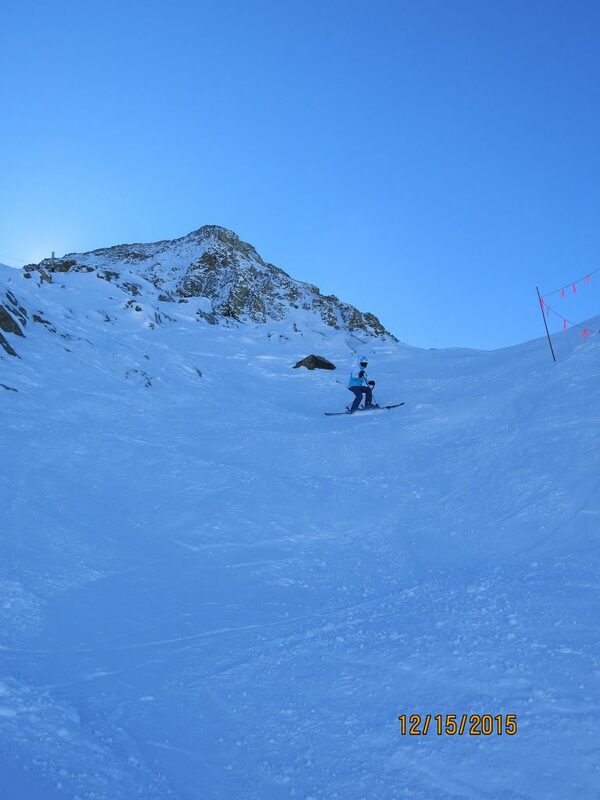 The “Main Street” Pallavicini run is an impressive avalanche chute that runs probably 1,500 vertical feet. It’s definitely an “Oh my god” moment when you stand at the top getting blasted by wind to pick your first turn carefully. 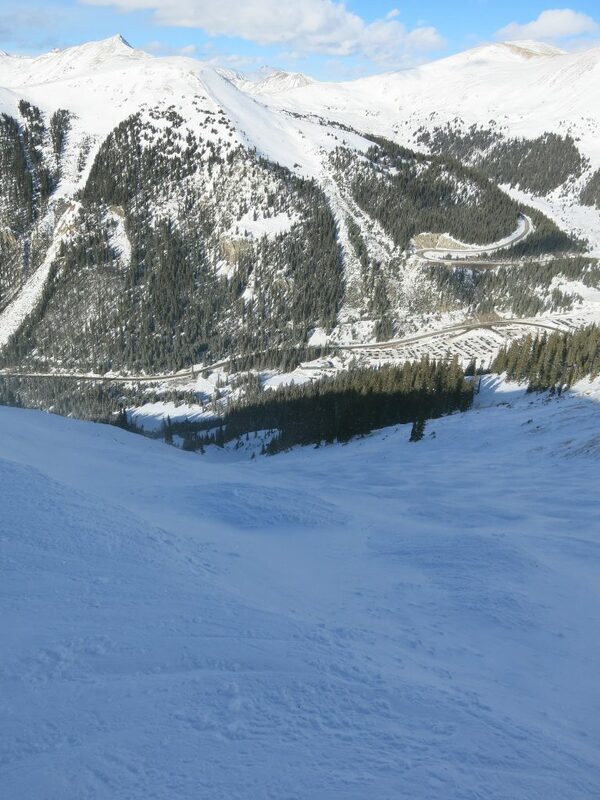 This is one of the most impressive runs that we have skied in Summit County. On Lenawee and Pallavicini there were very few people skiing. Most were on the Black Mountain express. 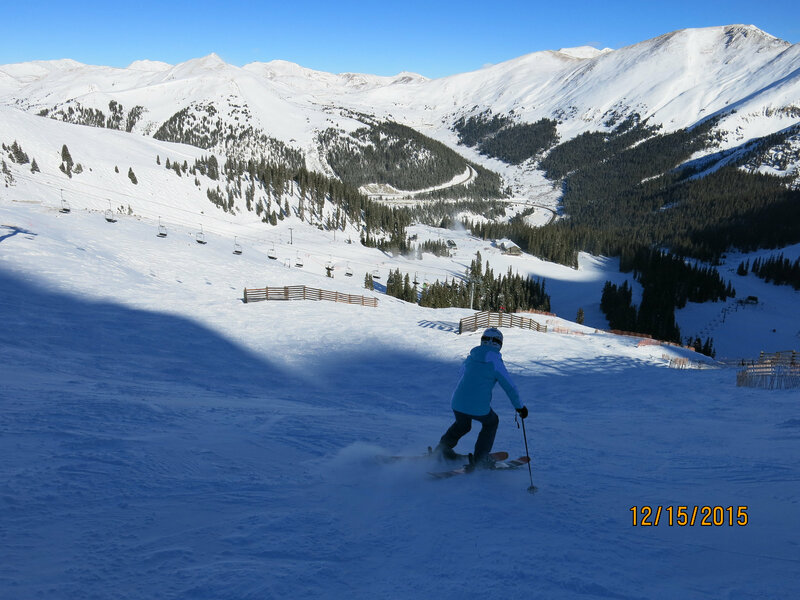 A few years ago A-Basin expanded into Montezuma Bowl with a new chair on the south-facing slopes. 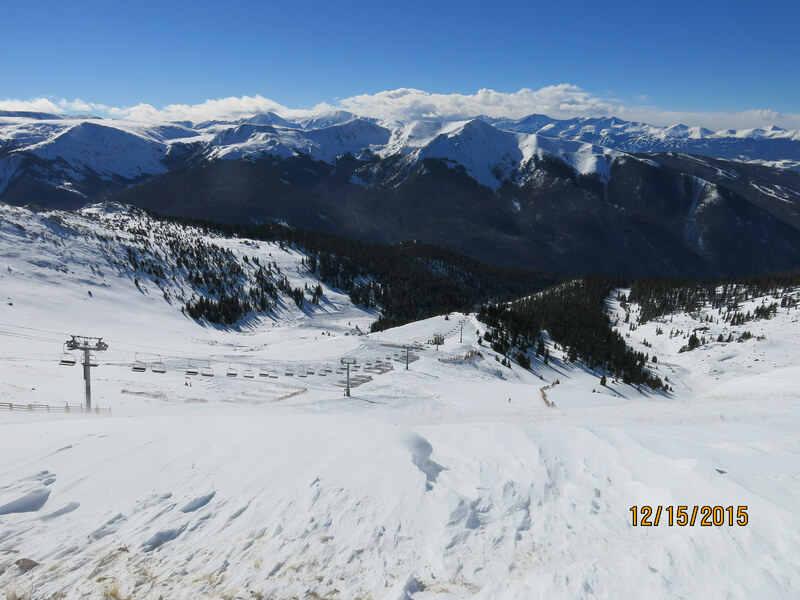 This wasn’t yet open when we skied there before Christmas, but it looks like great terrain. I assume that on a powder day you want to go straight there. For the 2018/19 season a whole new ski pod “The Beavers” opens up along the western side of the resort. 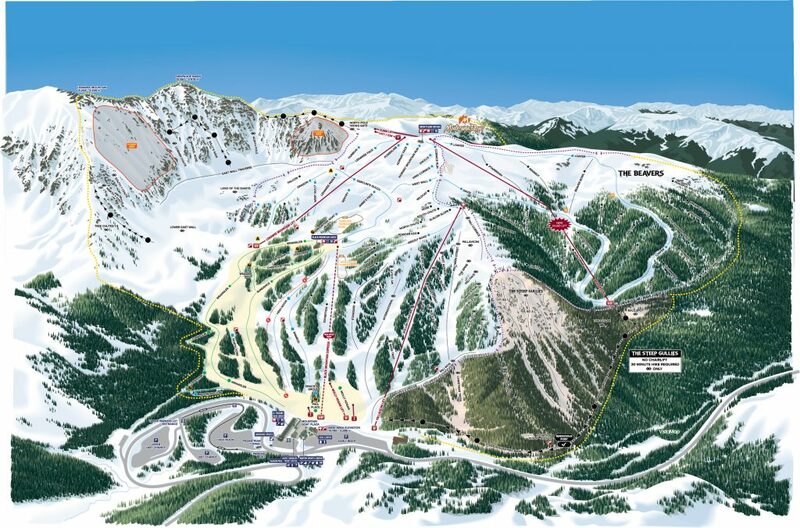 It’s hard to believe that A-Basin has only 1,428 acres with only 1698′ of vertical. Note that A-Basin does play games with the vertical drop number, listing 2270′ which is a hike-to number vs. the usual lift-served number most resorts post. However, there are four distinct ski pods with a large variety of terrain that could keep you busy for a couple of vacation days easily. There is obviously a dedicated group of locals that ski there regularly based on the conversations we heard in the lodges, and we can understand the enthusiasm for this place. 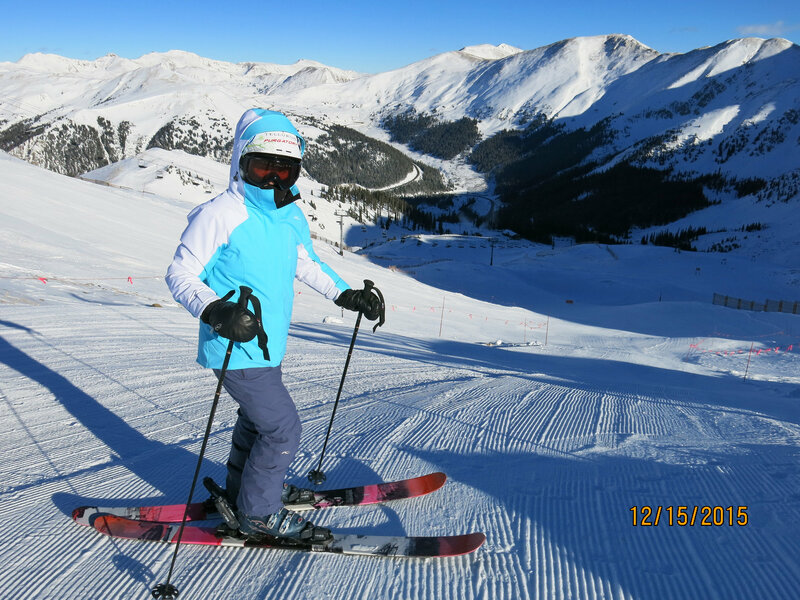 We found it very similar to another high-elevation ski area we love which is Ski Santa Fe. A-Basin has almost the same amount of vertical but with more steep terrain and more snow. They are both a lot of fun. Next time we find ourselves in Summit County we will likely go back to A-Basin. 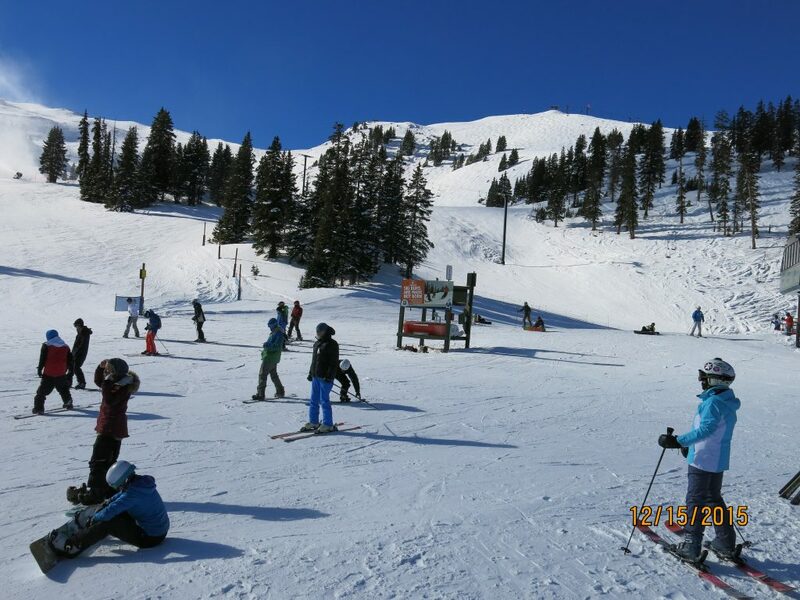 We had a blast there and would love to go back and try it again later in the season when Montezuma Bowl is open. We’d also like to try the new “Beavers” area which should be fun and which adds much needed terrain to the resort.